When people step into a residential bathroom one of the first items they notice is the shower. That being said it is important that your shower enclosure actually accentuates your bathroom. It needs to match your personal style as well as serve as a functional bathing area. There are many options in which to choose from, so without further ado here are the top fashionable options for modern shower enclosures. They are all popular choices; it just becomes a matter of personal taste. There is a good reason that frameless glass shower enclosures are such a popular choice with homeowners in this day and age. We spend a tremendous amount of time in our bathrooms on a daily basis, yet they tend to be the smallest rooms in the house. Glass shower enclosures provide openness, fluidity, and flow; thereby creating the optical illusion that there is more square footage or space in the bathroom. They are also extremely easy to clean and maintain. Most are treated with special finishes that help to repel those nasty water spots and soap scum. Glass block shower enclosures are both stylish and adaptable since they can be built into pretty much any size or shape imaginable. Modern glass blocks contain various textures and etched patterns that provide the homeowner with a personalized style. Glass blocks also provide strong architectural lines that give residential bathrooms a clean, yet stated design. There are a plethora of options available regarding the blocks themselves including various colors, styles, and thick nesses. Most of the glass block shower enclosures of the past did not include a door. However, the more modern designs now include stylish, frameless glass doors in order to effectively keep the water from escaping. 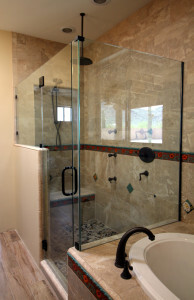 where a sliding glass shower enclosure comes into play. They are not only saving, but also extremely fashionable. 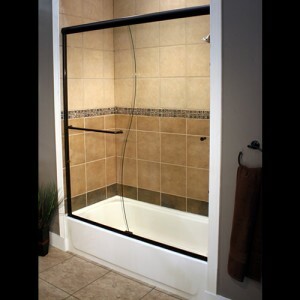 From a design aspect, sliding glass shower enclosures have the ability to be customized in order to fit any space. They are the perfect solution to showcase your shower while still providing you with enough room for other bathroom related activities. The textured glass shower enclosure is perfect for homeowners that would prefer privacy while in the shower stall area, without having to incorporate the frosted look. As a tremendous bonus, the gorgeous textures of the glass are vastly enhanced when the water runs down them. People relate this feeling to being in an expensive spa. In addition, textured glass does provide some see through aspects, which gives the bathroom the aspect of having more space. At the same time the texture masks specific details, so it does provide privacy. The tile and glass shower enclosure combines a frameless glass shower door with walls that are tiled with various materials such as stone, ceramic, or even glass tiles. For an added punch of style and function a tile surround with frameless glass windows may be included. This design aspect allows light to enter into the shower space, which in turn makes the interior feel much larger. If you are located in Scottsdale, Arizona or surrounding areas please contact us today for all of your glass shower enclosure needs. Our team of expert designers and installers are here to serve you.